The task is to determine the joystick position and represent this on the display via a crosshair. For a centred joystick, the crosshair should appear in the centre of the screen. If the joystick is pushed left or right, then the cross hair should move left or right according to the extent that the joystick is pushed. If the joystick is pushed forward or pulled back, then the crosshair should move up or down according to the extent that that joystick is pushed or pulled. The edges of the display represent maximum extents for joystick movement. For example, a joystick pushed fully forward would raise the crosshair to the top centre of the screen. A joystick pulled backwards and to the right would move the crosshair to the bottom right of the screen (except for a small area reserved to show joystick status). Implementations can use a graphical display method to produce the crosshair, or alternatively represent the crosshair using a plus symbol on a terminal, and move the plus symbol position according to the joystick. The bottom part of the display can hide or show an alphanumeric sequence to represent the buttons pressed. For example, if pushbuttons 1,4 and 10 are depressed, we could display "1 4 A". 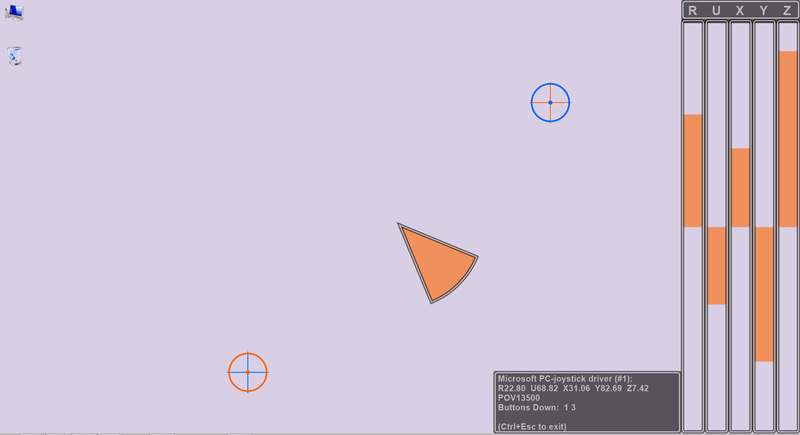 The implemented code should continue to redraw the crosshair according to the joystick position and show the current pushbutton statuses until the task is terminated. Digital joysticks that produce no extent data, should have their position indicated as full extent movement of the crosshair. For the purpose of this task, we assume that the joystick is calibrated and that the first joystick is being used. The task implementer could at their option provide a solution that includes a joystick selection facility, enabling the user to choose which joystick is to be used for this task. 420 P$(0) = "NOT PRESSED" : P$(1) = "PRESSED    "
MsgBox The system does not appear to have any joysticks. MsgBox The system does not appear to have a joystick number %JoystickNumber%. MsgBox, 48, Gdiplus error!, Gdiplus failed to start. Please ensure you have Gdiplus on your system. MsgBox, 48, Font error!, The font you have specified does not exist on your system. GetKeyState, Joy_Buttons, % JoystickNumber "JoyButtons"
GetKeyState, Joy_Info, % JoystickNumber "JoyInfo"
, FontOptions1 := "x" (IBX1 + 8) " y" (IBY1 + 8) " w" IBW1 - 20 " Left c" SubStr(Color2, 3) " r4 s" FontSize1 " Bold"
, FontOptions2 := " y" ABY1 + AxisLabelHeight - 40 " w" ABW1 - 10 " Left c" SubStr(Color2, 3) " r4 s" FontSize2 " Bold"
InfoText := Joy_Name " (#" JoystickNumber "):`n" Axis_Info "`nButtons Down: " Buttons_Down "`n`n(Ctrl+Esc to exit)"
Axis_Info .= val joy_%val% "  "
// Buttons assumed to be numbered from 1, not 0. // Map axis values in range -32767 to +32768 to termbox co-ordinates. // Under Linux the id is used to construct the joystick device name. // For example: id 0 will open device: "/dev/input/js0"
// Under Windows the id is the actual numeric id of the joystick. // Optionally pass joystick id to be used as a command line argument. hidden := false // Controls whether button display hidden or not. w <- getAsyncKeyState 27 -- ESC pressed? #m "backcolor black; color black"
#m "place 0 20;boxfilled 20 40"
#m "line  0 10 20 10"
#m "line 10  0 10 20"
#m "place 10 10; circle 10"
#m "backcolor white; color red"
#m "line  0 30 20 30"
#m "line 10 20 10 40"
#m "place 10 30; circle 10"
#m "getbmp plus 0 0 20 40"
if Joy1button1 > 0 then #m "place 0 0;\\Button 1 pressed"
if Joy1button2 > 0 then #m "place 0 0;\\\Button 2 pressed"
30 IF d THEN q$="*" ELSE q$=" "
110 IF a<16 THEN LOCATE 1,1:PRINT "             ":PRINT "             "
This is for the 64-bit version. Note: The code is not yet tested with a real joystick (I don't have one), it was just simulated with dummy functions. Can somebody having a joystick please test it, and remove this message? This is limited to only digital joysticks. Assuming a Kempston joystick interface, fairly standard at the time. Rewriting for the Sinclair Interface 2 involves changing line 80 to 80 LET t=IN 61438, replacing all numbers in the next five lines with 191-said number and reversing each pair of directions. This page was last modified on 8 March 2019, at 08:14.